The swiftness and power of the Pinware River has created its own gorge in the landscape where it flows for miles through the wilderness of Southern Labrador, Canada. 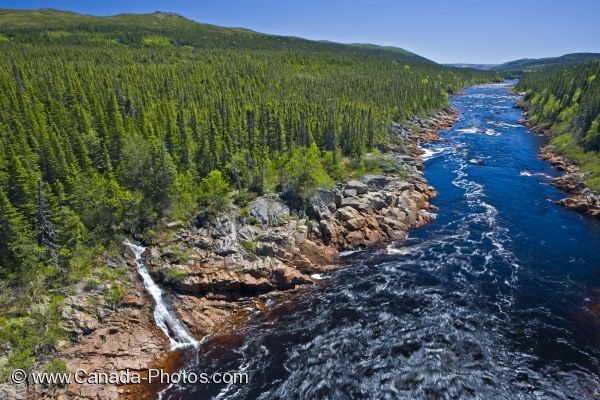 Looking down upon the river from the Labrador Coastal Drive, the scenery is stunning as a waterfall cascades from out of the base of the trees over the reddish brown colored ledges as the rapids along the water show off their power. There was once no way to cross the Pinware River keeping communities on either side of the river apart. In 1965, a bridge was built which opened an entire new world for the people of the villages. The Pinware River is not safe for swimming but it is a beautiful place where the scenery is stunning not only for tourists but for fishermen who spend their days along the river banks in hope of a trout or salmon. Picture of the breathtaking scenery of the Pinware River Gorge flowing amongst the wilderness of Southern Labrador, Canada.